Naomi qualified in December 2015 having trained here at Damory since May 2013 and was promoted to Team Leader along with Leanne at the begining of 2018. She enjoys all aspects of nursing but has an interest in species appropriate nutrition and is a Raw Food Advisor. 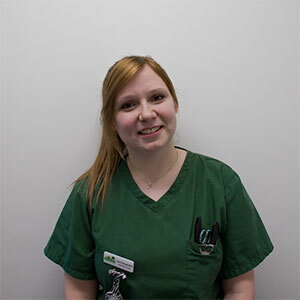 Currently she is completing the Diploma of Higher Education Clinical Veterinary Nursing including the Advanced Nursing Diploma to expand her knowledge and nursing skills. Naomi also is a clinical coach helping to train our student veterinary nurses. Naomi lives with her boyfriend Ben and her crazy working cocker Lottie who she enjoys walking.